The United States is continuing to fill the coffers of the corrupt Palestinian Authority. This time with $150 million as the first installment of a promised aid package of $500 million dollars. (Al-Hayat and AFP) Connect the dots. Israel has officially boycotted al-Jazeera. The Israeli foreign ministry has announced that it will deny al-Jazeera reporters interviews with government officials and entrance visas. This Israeli government said this decision is the result of al-Jazeera’s “biased” (muhayza) reporting of the events in Gaza. Al-Jazeera reports that some observers say this is another step in the Israeli media war against Palestinians. Believe it or not, al-Jazeera, as well as al-Manar, are widely available on satellite tv inside Israel. The article did not say if the boycott would affect access to the channel inside Israel. Al-Jazeera reports that Republican presidential candidate John McCain will visit Israel on March 20 as part of a delegation of U.S. senators. This is reportedly the first time that a Republican or Democratic presidential candidate has visited Israel during an election year. A commenter on al-Jazeera pointed out that this visit will coincide with the fifth-year anniversary of the war on Iraq. Start with a trip to Tel Aviv and eat at the vegan restaurant Tov al-Khaim (Taste of Life). Their lasagna is really good. Seriously. 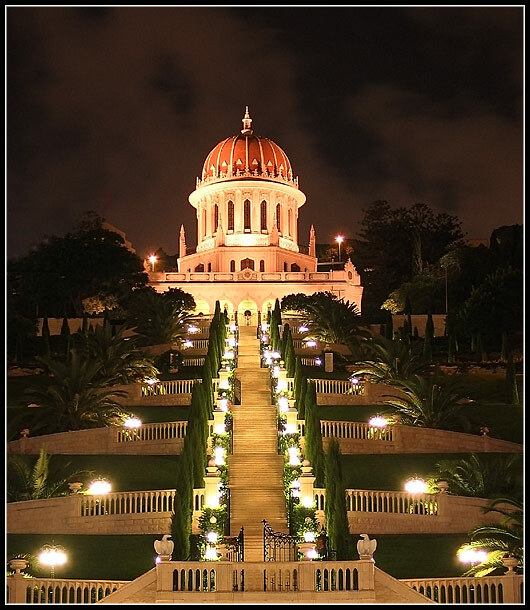 Then he could make his way north to Haifa and check out the very cool Bah’ai Temple. If he’s feeling ambitious, then he should head on over to the West Bank and visit the newly expanded Jewish settlement Givat Zeev. McCain is really old, so if he feels like he’s about to die or something, he should check out the awesome medical facilities in Gaza City. It might take him, like, a lifetime to cross the border and then another month to get adequate medical supplies, but this should be no problem since he has been complicit in instigating civil strife in Gaza! But wait — what do you say? The U.S. plan backfired and actually increased support for Hamas and allowed the group to gain full control of the Gaza Strip? The article tracks American policy makers’s relationship with Mohammad Dahlan, a Fatah official and former security advisor, who has been instrumental in orchestrating deals between Fatah fighters and the U.S. In 2006, Bush encouraged Palestinian President Mahmoud Abbas to hold parliamentary elections in the West Bank and Gaza Strip — not expecting that Hamas would win a majority of seats in the Palestinian parliament. What I find most depressing, though not shocking, is how Fatah officials are so willing to collaborate with Israel and the United States. These officials are more interested in preserving their positions of power and taking illicit bribes than working with Palestinians against a brutal military occupation. Read the full article for more details about how the US provided Fatah with arms shipped through Egypt and approved by Israel. Way to go, Fatah! You know your morals are intact when you are receiving weapons shipments approved by the very power which is occupying your land and killing your people. It is curious that Fatah is not able to see that the ultimate benefactor here is Israel. Fatah and Hamas are being torn apart by internal violence while Israel solidifies control over Palestinian land. East Jabaliya in the northern Gaza Strip bore the brunt of Israel’s latest military incursion into Gaza. The incursion, which was launched in the early hours of Thursday February 28, lasted four days and nights. In that time Israeli troops killed 108 Palestinians, including 54 unarmed civilians, 26 of whom were children. The Palestinians who live in and around Abed Rabbo Street in east Jabaliya suffered intense air strikes by F16 planes and helicopters, tank shelling, snipers, and having their houses invaded and vandalised by Israeli soldiers, who tied adults up with ropes, or else locked whole families into single rooms in order to use their homes as sniper towers to target local Palestinian fighters. Sixteen year old Jaqueline Abu Shebak and her fourteen year old brother, Iyad both lived on Abed Rabbo Street with their mother and three other young brothers and sisters. The children’s uncle, Hatem Hosni Abu shebak, who lives next door, found the bodies of Jaqueline and Iyad in the early hours of Saturday March 1st, when he rushed upstairs after hearing intense shooting and then screaming. “I hear shooting and Iyad was screaming. As I ran upstairs the shooting continued, and both children were on the living room floor “he says, as we sit in the blood-stained living room where Jaqueline died and Iyad was critically injured. “I tried to revive them, but Jaqueline was dead, and even though Iyad was alive and making sounds we could not save him. We had to wait for an ambulance because my car had been shelled by an Israeli tank.” Hattim Abu Shebak shows us the mirrors and windows shattered by bullets, the bullet holes in the walls, and the children’s blood on the furniture. The Israeli soldiers who killed Jaqueline and Iyad had occupied the house opposite, and were holding Ramez Etbail and his family hostage so they could use the house to shoot at local Hamas fighters. The Israelis fired straight through the kitchen window of the Abu- Shebak house, striking Jaqueline and Iyad who were both cowering in the corner. The text on the uniform reads “Olmert” as in the Prime Minister of Israel Ehud Olmert. The text reads: Gaza Holocaust (Mahrakat Gaza). Brief explanation of the video: “This is not a war zone or a field of battle — this is a residential area of the Jabaliya Palestinian camp in Gaza.” At 25 seconds into the video, there is a young man lying on the ground and another youth runs up to him saying, “There is no God but God and Muhammad is his Prophet.” He is most likely saying this because he anticipates that the young man on the ground will die soon. At 1:00, the voice-over says that this is a scene from the Jabaliya Palestinian camp. You are currently browsing the Palestine category at the news in arabic.